If you are in the market for wireless credit card processing, you know precisely how expensive it can be. With high rates and a pricey mobile credit card terminal, it can oftentimes be difficult to justify getting it. After all, small businesses have small profit margins, and anything extra may be just a bit too much; fortunately, you don’t have to worry about that anymore. Welcome to Total Merchant Services, and say hello to your free Ingenico iWL255 3G portable credit card terminal! The leader in wireless credit card processing, the Ingenico iWL255 offers reliable payment processing with new age technology, making this one of the best offers you’ll find all day. Trust us; at a $599.00 value, you won’t get any better than the Ingenico iWL255, especially for free! Read on for more information concerning this offer and the wireless credit card processing services at Total Merchant Services. As we’ve already mentioned, the Ingenico iWL255 is one of the leaders in wireless credit card processing. Scroll below to review some of the features you’ll be getting with this incredible offer. 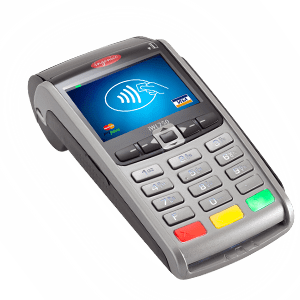 EMV Smart Card Ready: The Ingenico iWL255 is EMV (Europay, MasterCard, and Visa) smart card ready so that you will not need to update you equipment when it becomes a requirement to accept smart cards at your business. 3G Wireless Service: The Ingenico iWL255 uses the latest available 3G wireless technology resulting in a higher reliability than its 2G wireless credit card terminal predecessors. NFC (Near Field Communication) Enabled: Accept ApplePay and Google Wallet as well as contactless cards on your Ingenico terminal. This built feature of the iWL255 will be covered in your free telephone training call from our credit card terminal specialist. Faster Transactions: Even though this is wireless technology, the iWL255 is one of the fastest payment processing terminals around. You’ll never have to wait for a transaction to go through again as this incredible terminal has an ARM9 32-bit processor at its core, one of the most powerful in the business. This makes it fast, reliable, and error free for years to come. Fast Printer: The 30 line per second printer that comes with the Ingenico iWL255 is lightweight and extremely efficient. Able to print out receipts in no time, it will make your job that much easier, while giving error messages when it is almost out of paper. Easy to Use: We offer a free, high quality course on the use of the Ingenico iWL255; however, chances are you won’t need it. It’s extremely easy to use, and you will be able to pick it up in no time whatsoever. You will also receive a quick reference guide on the use of your terminal. Lightweight: Unlike many of the wireless credit card processing terminals out there, the Ingenico iWL255 is extremely lightweight, making it easy to hold and use on a daily basis. Other Cool Features: Add your logo or other image as a custom screen saver or to your receipts. Customize your footer messages asking for referrals or anything else you would like to add. Included dock makes for easy charging or connecting the terminal to your internet connection. In addition to all this, Total Merchant Services offers a host of great services to make your business run easier. With our price matching guarantees, one on one customer support, free telephone training, and Global Access Advantage online reporting, the payment processing portion of your business will run like clockwork, and you’ll never again have to worry about it! Add in the fact that all of our services are exceedingly affordable, and it’s easy to see why so many choose Total Merchant Services. In the end, if you are in the market for credit card terminals, are interested in our free Ingenico iWL255 offer, or are just trying to find a better merchant services provider, then contact Chris Judy of Total Merchant Services now at 1-800-518-6825. Rest assured with our $500 meet or beat guarantee on pricing you will have the best rates available along with your free wireless credit card terminal. Are you ready for your no obligation free wireless credit card terminal proposal? Provide at least your first name, email, and phone number in this form. Chris will send you all of the details on his merchant services along with the Free Terminal Program. The more information you provide the better he can assist you with your processing needs.